Our son came home from Germany very enthusiastic about Bavarian Pretzels. Together we came up with this recipe and did not disappoint his memory of what it tasted like. We served it with a good quality sweet grainy mustard and German Sausage, like Thuringer. Mix 4 cups of flour with the dry yeast, brown sugar and salt. Continue to add flour until you have a nice soft workable dough. 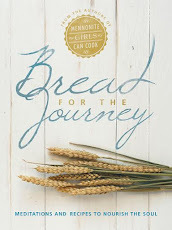 It is best to keep working the dough by kneading it rather than adding more flour. Adding to much flour just makes the dough tougher rather than soft and elastic. Be patient, it takes about 8-10 minutes or so. Let the dough rest about 20-30 minutes. If you do not have time to make the pretzels right away the dough can be kept in the fridge over night if need be. Divide the dough into 18 balls and roll each ball into a strip about 18" long like this. 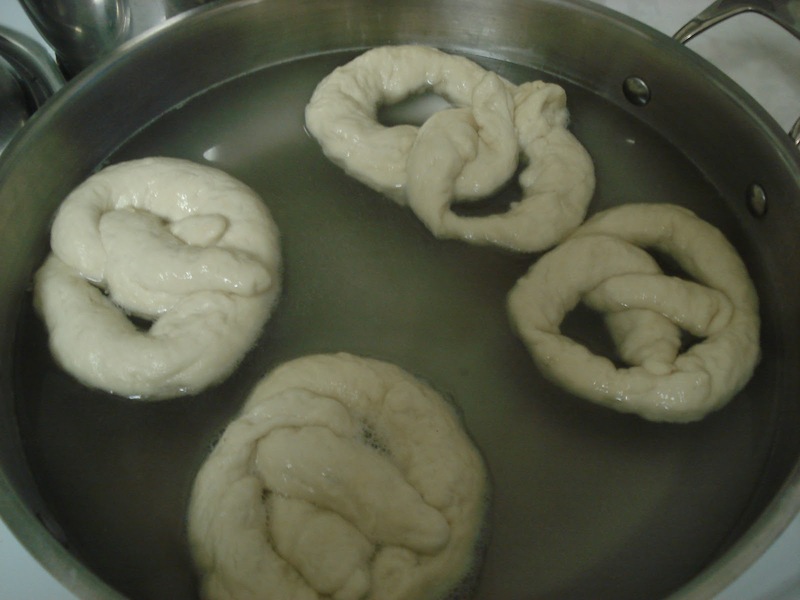 Boil the Pretzels in 3 cups water mixed with 3 tablespoons Baking Soda. Make sure that the entire pretzel is immersed in the water for 10-20 seconds. Remove from Water bath. Place onto a parchment lined baking sheet. Sprinkle with coarse salt. (Optional). Try Parmesan cheese and garlic salt instead or create your own topping favorites. Bake in a 400 degree oven for 18 minutes or until golden brown. This is an example the difference it makes when you boil the pretzels. The one on the left is boiled, then baked, it has a chewier texture than the one on the right which is just baked. There is a difference in both color and texture. We prefer them much better boiled and then baked. It is totally worth the extra step! 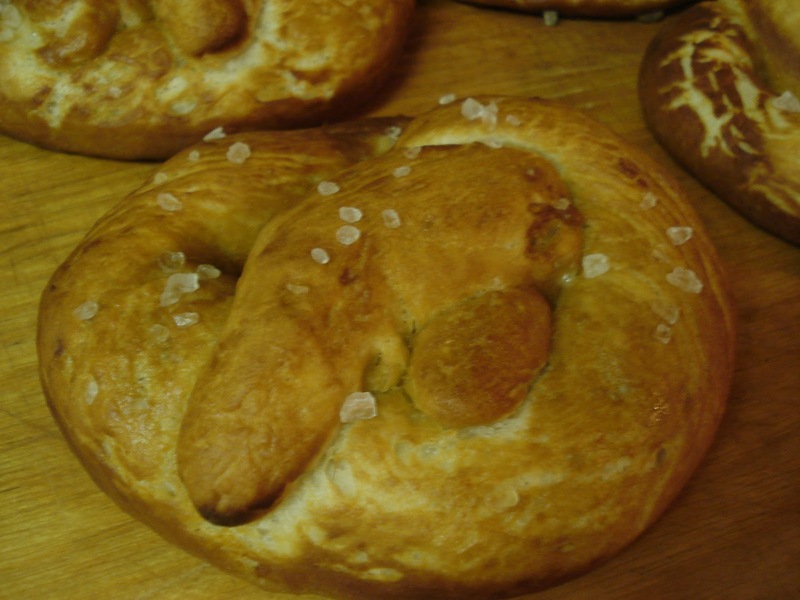 I visited Germany in 2006, and totally fell in love with their breads, etc. It was so disappointing to come home and not be able to find any recipes that produced the sames things that I ate over there. 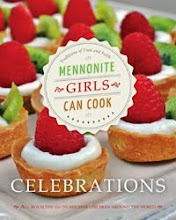 So...thank you for this recipe that I'm going to have to try...soon! If you paint the pretzels with egg wash before sprinkling the salt, they get a nice shine and the salt sticks better. No need to paint the pretzels with egg wash the boiling does the trick. These are amazing. I tasted ones like this and I will be sure to make them. These are the best and quickest pretzels I've ever made ... and I'm from Bavaria! 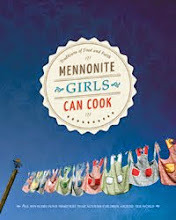 Great job, mennonite girls! Petra, so glad you liked them. So did you use the egg wash or not? I would have to agree, they are very good. How extraordinary! My mouth recalls eating boiled pretzels many years ago, but the German bakery that made them is long gone. You're absolutely right the boiling is what makes it. Not boiling = not a Bavarian Pretzel. Gosh I can just feel the resistant pull biting into one followed by the taste spike of the rock salt. And look, you're so trendy. Even chocolates have a sprinkle of rock salt now. Check out your local Purdy's for Himalayan Pink Salt Caramels. OMGosh they looks so yummy!!! OH my goodness these look amazing! I get your emails daily and it is such a joy and I look forward to them everyday. Such a variety of yummy goodies to go around. Thank you Ladies for this site and all the humble things you bring with it. 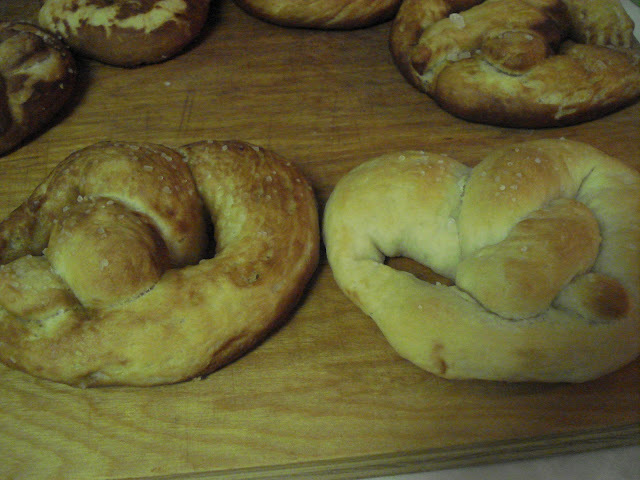 These look beautiful and I'm loving this website, but I can't pass a German pretzel recipe without shouting . . . lye! Otherwise known as sodium hydroxide, chemical formula NaOH, "Lauge" in German. A dip in a lye bath is the essential step for shiny pretzels with a dark brown, crunchy, savory crust that just tastes like pretzel. It's cheap and available everywhere in Germany in crystal form - we're an immigrant family so we usually have relatives bringing it over. Oh, and wear gloves or use utensils as it will react with the oils on your skin to make soap, which is neat but can cause burns. I love this website, Its has such great info & awesome tasting recipes...!!!! !